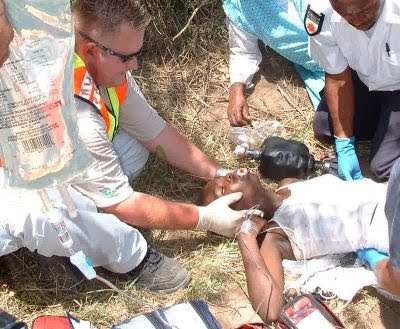 A man in Cape Town was crushed to death by a concrete mixer he was cleaning. A spokesman for ER24 said the machine was turned on accidentally while the person was working on it. This was the second concrete mixer fatality in Cape Town in a period of less than a month. Five workers were critically injured when the roof they were working on collapsed at the Omnia fertilising factory at Cato Ridge last week. A spokesman for Netcare 24 said "the workers from a contracting company were fixing the asbestos roof when they fell through". The workers had fallen about five metres when found. The injured men were all admitted to the St Augustines Hospital in Durban. At the time of the incident, the cause of the collapse of the roof was unknown. A provincial spokesman for the Department of Labour confirmed that "full occupational health and safety investigation" was launched to ascertain what had gone wrong.